Alfred is a Traditional Chinese Medicine Practitioner & Registered Acupuncturist with 30 years of clinical experiences in both Western and Eastern medicine. He was a case manager and clinician with the South Mental Health Team & Cambie Older Mental Health Team for many years. He has extensive knowledge and experience in the field of mental health and drug addiction service with VCH Community component. Alfred is a strong believer of naturalistic approaches in using holistic methods of improving health and wellbeing. He uses both refined herbal medicine and acupuncture to treat his patients. He takes time to educate his patient on the causes of disease and the best preventive and treatment options available. His treatment enables the body to rebalance and heal itself by stimulating “Qi”, the innate energy or life force. Alfred has special interest & focus in Acupuncture Oncology, as well as a passion for working with cancer patients. He strives to improve the quality of life for his patients in their fight against cancer. Over the last several years, Alfred has treated various and numerous cancer types, cases ranging from brain, lung, breast, colon, kidney, cervical, pancreatic, liver and leukemia for people as young as 4 years old. Currently he is the chief acupuncturist at the Cancer Care Center, Integrated Health Clinic in Fort Langley, responsible for Cancer Focused acupuncture. Alfred also teams up with a Naturopathic doctor who is an expert in women’s health to provide Fertility acupuncture for women who wants to conceive and start a family. TCM & Acupuncture has proven to be very beneficial to improve the chance of conceiving and success in IVF. It is highly recommended for both mother and fetus health. He also has keen interests in smoke cessation, drug & alcohol addition, chronic illness, chronic pain, sport injuries, stroke recovery treatment and prevention, menopause, insomnia, osteoarthritis etc. 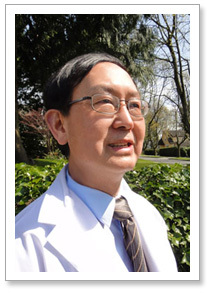 Master Tung Acupuncture by Professor Young Wei Chieh – a very popular acupuncture module in the US, Taiwan and Korea. This module is very effective for pain, arthritis and other health issues. YNSA Scalp needles by Dr. Med.I-Hsing Chuang, a famous Western Neurologist & Acupuncturist– this technique was developed by Dr. Toshikatsu Yamamoto, MD PhD in Japan. This is a technique famous for neurological issues, paralyses, tinnitus, eye problem and stroke rehabilitation. It is popular & commonly used in Japan and Europe. Continue education in Cancer focus, Infertility acupuncture etc. During his time of leisure, Alfred enjoys nature walk, meditation, medical Qi-Gong, calligraphy and reading the latest research articles and medical books.